Login to View Rewards or Register Now! What is the Cashback Program? The cashback program is our new and simple way for all customers to start earning towards rewards. With all tasks that are completed and by completing new orders all customers will now earn reward points that can be spent towards Tokkyo Nutrition products. You simply need to make sure you use your account as a customer to track and spend your reward points from now on! HOW MANY REWARD POINTS ARE GIVEN? Reward Points are given on all completed order that you have submitted. Reward Points are given as a 1:1 conversion of dollars (before tax & shipping). If the order does not get ship, such as cancellation or refund, no Reward Points will be given. Product reviews can only be submitted if you have purchase the product previously in your orders on the new website. Once you have done so, you visit the product page of each item and submit a written review on the right side. Only approved reviews will reward you with points and only one review per product per customer will give you points. Can I refer other people to earn points? Currently we only allow our sponsored athletes and ambassadors to refer others to Tokkyo Nutrition for safety of our potential customers as they have to meet certain guidelines. Are you interested in earning some products with your confidence by referring others? Look into signing up to become an ambassador today! How do I start earning reward points? All registered customers of Tokkyo Nutrition are already earning reward points since we have released the Cashback program. 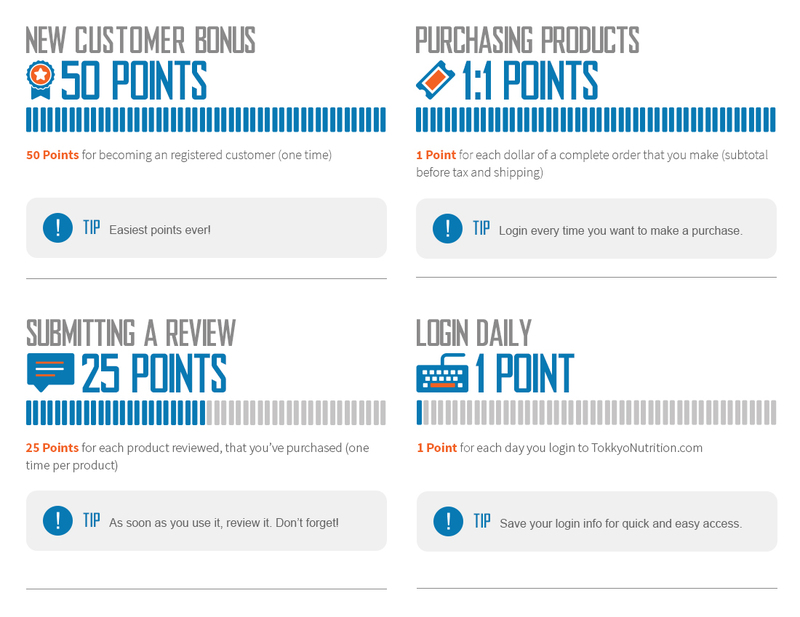 Some reward points can be earned through the tasks listed below in the graphic and others can be earned simply by placing orders. So make sure you have an account registered and that your earning on all of your next orders! Almost every product on the Tokkyo Nutrition website can be bought with points at a 6:1 rate once you have enough points. During the purchase process you can select ‘Pay with points’ above the ‘Credit Card’ option on checkout. Note that you must have at least over $50 dollars worth of products before you will given the new payment option. What about points for past orders? We are only giving points to all new orders that are placed since the Cashback program has started and will no give reward points for any past orders. Everything is tracked automatically through our system to ensure all reward points are given to each customer as well.